Fu Ying Visits Headquarters of Arup Group Ltd.
On December 14, 2007, H.E. Mme. 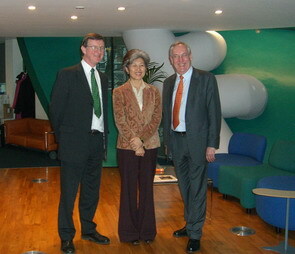 Ambassador Fu Ying visited the headquarters of Arup Group Ltd. Terry Hill, Chairmen of Arup Group Ltd. and Advisor of British Architecture Committee, and John Miles, director of Arup Group Ltd. and chief of Consulting, welcomed Fu and hoped to establish a long-term cooperation with China. Peter Budd, Director of Beijing Branch, Arup (Shanghai) and Advisor of British Aeronautics Committee made a detailed introduction to Fu Ying about history of Arup Group Ltd. and its landmark projects, including Sydney Opera House in Australia, Centre National d'art et de Culture Georges Pompidou in France and "London Eye" in UK. He denoted that Arup participated in designs of Chinese National Stadium and National Aquatics Center for 2008 Beijing Olympic Games, T3 Terminal of Beijing Capital International Airport, new office building of CCTV, Phase III of Beijing World Trade Centre and Shanghai Dongtan Eco City. Arup also provided new design of sports car for Nanjing Automobile Corporation. The leaders of Arup Group Ltd. emphasized that Arup attached great importance to integrate environmental protection into design. For example, the design of National Aquatics Center managed to collect and recycle rain to clean the venue. Fu Ying made positive comments on Arup's achievements in China and its environmental protection idea. She denoted that the Chinese government encouraged more Chinese enterprises to go abroad and actively participate in the international market. She hoped that Arup Group Ltd. could provide consulting services to Chinese construction enterprises for projects in UK and provide China with information to purchase environmental protection and energy saving technologies. Fu Ying suggested that Arup should make use of the internet and media for its publicity in China to ensure more business opportunities. Arup Group Ltd. was founded in 1946 and is one of the biggest engineering consulting agencies in the world. It has diversified businesses and provides overall planning, evaluation, feasibility study, specific design, and project management and construction supervision. It has 92 branches in 37 countries with more than 9,000 employees, and an estimated 700 million pounds revenue in 2007.